Peckinpah enjoyed an uncomplicatedly good reputation precisely once in his career: after the release of his second feature film, Ride the High Country, in 1962. This elegiac treatment of the Old West dying into modernity remains a lovely movie and a luminous touchstone of Peckinpah’s valuesâ€”especially in its focus on two aging friends, one of whom continues to live by their old code of honor while the other is tempted to abandon it. The film boasts vivid characterizations in major and minor roles, and a wonderfully flavorful familiarity with frontier life and color. Although westerns were dÃ©classÃ© for the tastemakers, and the film had been dumped by a new administration at MGM, somehow reviewers in the national press discovered Ride the High Country and took itâ€”and its promising young auteurâ€”under their collective wing. Ride the High Country is still the only Peckinpah movie virtually everyone can get together in admiring. Cinematically, however, it’s a fundamentally conventional film. Those who nostalgically prefer it to the more stylistically adventurous, and temperamentally contentious, works that followed must have an aversion to voluptuous kinesis. In both those films, Peckinpah may be observed embracing his medium with a sheer overwhelming excitement in craft and discovery that makes the “willful neglect of simplicity” seem a rather mean-spirited response. Cable Hogue in particular finds Peckinpah developing a direct analogue for his protagonist’s bounteous sense of life in the teeming playfulness of his own directorial invention. But for less discerning critics than Sarris and Thomson, Peckinpah’s very vitality and almost tactile effectiveness as a filmmaker seem dangerously suspectâ€”too close in volatility to the violent subject matter he has often gravitated to. The reach for a beauty and excitement associated with stylized violence and violent stylization became evident at least as early as Major Dundee (1965), that muddled but fitfully brilliant allegory of a divided America groping its way back to wholeness by way of an outlaw military expedition in the last days of the Civil War. Major Dundee was also the firstâ€”but far from the lastâ€”of Peckinpah’s pictures to be mutilated by producer or front-office interference. Mostly because of his misadventures on that project, the director was blacklisted by the industry for several years. By the time he returned to feature-film activity with the controversial, epochmaking The Wild Bunch, he was well on the way to becoming a more mythically embattled figure than any he ever made movies about. And so, more and more and with greater directness, his movies began to be about him. And the more often commentators fell back on dubbing him “the Mozart of violence” or “the master of machismo,” the more inevitable seemed the inevitable confrontations between Peckinpah and his employers. The Killer Elite (1975) inspired Pauline Kael’s astute appreciation “Notes on the Nihilist Poetry of Sam Peckinpah” (The New Yorker, January 12, 1976), but what she says about the increasingly hallucinatory progression of his narratives and the explicit valorization of his own struggles with heartless powerbrokers applies equally to Pat Garrett and Billy the Kid (1973), Bring Me the Head of Alfredo Garcia (1974), and Cross of Iron (1977). Early in Pat Garrett and Billy the Kid, Billy and his cohorts amuse themselves by shooting the heads off chickens buried in the dirt. Pat Garrett arrives unnoticed, lifts his rifle behind the Kid’s back, and firesâ€”not at the man we historically know him to have killed, but at one of the birds. Garrett and the Kid go off to have a friendly drink: the mythic moment will wait awhile. For the present, children scurry forth to claim the chickens’ bodies, the byproducts of this lethal entertainment, for the family dinner table. 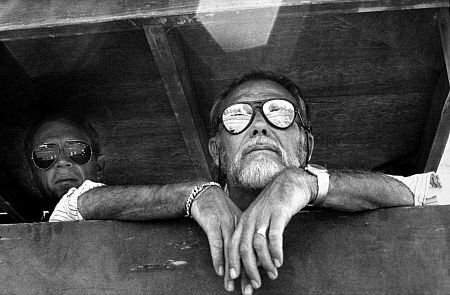 Peckinpah has long known that societies feed off their myths, and off the heroes who live them. (Sometimes they call it Christianity; at others, rock stardom.) The clear danger for Peckinpahâ€”and those of us who thrive on his gifts of both dramatization and self-dramatization, and honor his integrity in a world with whose trendiest values he cannot help but conflictâ€”is that he and we can turn his history of recalcitrance into a self-fulfilled prophecy that will deny us further additions to a rich and challenging body of work. For this Film Comment midsectionâ€”a small attempt to testify how much Sam Peckinpah has mattered to some of usâ€”the decision to feature The Ballad of Cable Hogue and Bring Me the Head of Alfredo Garcia is based on three factors: They’re two of Peckinpah’s most personal films, projects he himself originated; they’re two of his best films; and they’re two of his least-known and -appreciated (particularly Alfredo Garcia, which had scarcely any first-run release and virtually defied editing for televisionâ€”in light of which, we have taken the liberty of describing it at some length). For commentary on the better-known Western films, see the relevant chapters of Jim Kitses’ Horizons West and Paul Seydor’s Peckinpah: The Western Films, which also includes detailed accounts of what is and isn’t in the cut films.